I began teaching 20 years ago in Irvine, CA. I was a member of the USPTA for 10 years and now a member of the PTR for 10 years. I've been an in store TECH ADVISORY staff member for Wilson Sporting Goods Co. and USTA clinician, a volunteer Area Coordinator for the USTA School Tennis Program in Orange County and studied the 10 and Under coaching program with Kirk Anderson in San Diego. 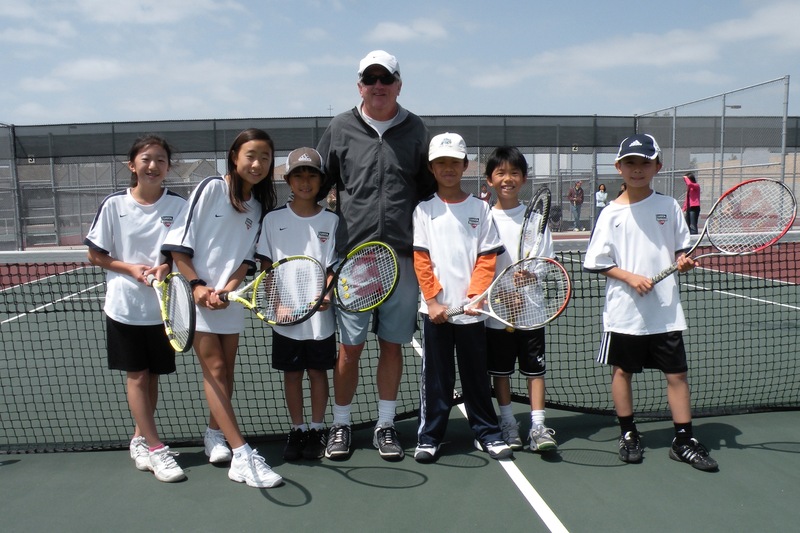 I've also been an Instructor for the Amateur Athletic Foundation Southern California National Junior Tennis League and coached junior team tennis players for more than 10 years with 12's and 14's teams going to the Section Championships and many students making their high school tennis teams. Lately I have been teaching summer camps for the iPSF in Irvine. Never played in college but have been playing for almost 30 years and teaching for the City of Irvine for 20 years. I love the sport and enjoy teaching the game to all ages. This photo was taken after our 12 and Under Jr. Team Tennis match at Woodbridge High School. This photo was also taken after a JTT match at Woodbridge High School. I am currently a member of the Professional Teaching Registry and have been an in store TECH ADVISORY staff member for Wilson Sporting Goods Co. and USTA clinician. I've also been a volunteer Area Coordinator for the USTA School Tennis Program in Orange County and studied the 10 and Under coaching program with Kirk Anderson in San Diego, an Instructor for the Amateur Athletic Foundation Southern California National Junior Tennis League and coached junior team tennis players for more than 10 years with 12's and 14's teams going to the Section Championships and many students making their high school tennis teams. I got started teaching as an assistant to Coach Chris Emery in Irvine, California. I've worked with students 4 years old and up, some with physical impairments and some with autism.